You can get to Da Lat by land, enjoying the landscape – as I always prefer, -, as well as by bus and by train: from Ho Chi Minh it’s about 7-9 hours away and from Mui Ne, about 5 hours. If you prefer, you can fly to Da Lat from various destinations; the airport is located 30 kilometers from the city center. There are tons of family run Guest Houses where you can spend the night. Usually, to make you feel at home, they’ll offer you dinner, at least the first night. Other nights you can take advantage of it for laughable prices. It will be spectacular to be able to eat and share a typical Vietnamese meal with the family. You’ll never feel alone in Vietnam, but always welcome and loved. I stayed at the Tiny Tiger Hostel and loved it. Obviously there are lots of hotels. Click here to read our review of the best hotels in Dalat. 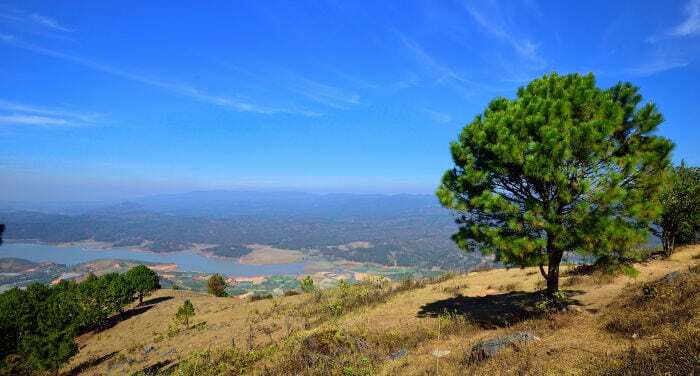 What is there to see in Da Lat? Walking through Da Lat is simple and lovely: lose yourself between the French quarter and the lake, discover the colonial homes along the road and every so often enjoy a tasty, unmissable coffee. These are just a few of the not-to-miss destinations that I want to recommend along with a coffee and a snack. A fascinating, somewhat strange and colorful pagoda, that you shouldn’t miss if you come to Da Lat. In fact, it is made up of infinite mosaics of glass and tile taken from broken bottles and cups. In addition, inside an internal hall, you can also admire imposing wooden tables made from single logs. From the highest tower you can admire the panorama of the delicious surrounding countryside made up of so many flowers, strawberries and coffee plantations. The old station in Da Lat is a building built by architects Moncet and Reveron, in typical French architectural style. Known as the Hang Nga Guesthouse, the “crazy house” is a surreal house designed by a Vietnamese architect, Dang Viet Nga. It’s an unconventional expressionist structure that brings to mind the whimsy of Gaudi in Barcellona. There are loads of stairs inside and views of the town, as well as amusing ornamental decorations like mushrooms, animals and caves. You might just feel like Alice in Wonderland. The price of an entrance ticket is 40,000 VND. A distinction of Da Lat: flower and coffee plantations and lots of tasty strawberries! Also known as the city of flowers, Da Lat is an alternative to the usual tourist route. There are two flowers in particular that grow here and are the crown jewel of the flower-growing industry: the hydrangea and the helichrysum. You can see and visit extensive fields of flowers and greenhouses just outside the city along the surrounding mountains. The coffee of Da Lat is an institution, as it is in the rest of Vietnam. Vietnam, in fact, is the world’s second leading producer of coffee. In Vietnam the plantations are small, family-run, and the tradition in Da Lat calls for the production of Arabica coffee. The distinction of some of the plantations however isn’t coffee, but how a part of it is treated. Actually, Asian civet cats are raised here that feed solely on coffee beans, and from their excrement they make a gourmet coffee. That might not seem at all appetizing, but I can assure you that it’s really good! What amazed me the most about Da Lat isn’t the coffee, but the strawberries. There are greenhouses scattered everywhere. Moreover, you can taste local specialties such as strawberry jam, dried fruits, avocados and artichokes. To visit the city I recommend that you rent a bike or scooter and get lost in the town, which isn’t too congested compared to other cities like Ho Chi Minh or Hanoi. In addition, there are many routes outside of town you can tackle through hills and mountains with pleasant and fresh views. You can rent a bike for just 120,000 VND a day. Datanla Waterfall, translated as “waterfall under the leaves”, is a waterfall located 5 kilometers south of the city, 15 minutes by motorbike, on the road that leads to Prenn Mountain. At the falls you can try different sports or just walk through the forest to the falls. From here you can also explore Elephant Waterfall, one of the most spectacular waterfalls in Vietnam, for the majesty and width of its stream, as well as the road that you have to take to reach it, where you can admire various colonial style houses and numerous, elegant cafes. If instead you’re looking for a place to relax, there’s the Monastery of Truc Lam, where you can both meditate or do yoga, enjoy a breathtaking view, walk through a well-manicured relaxing garden, and take a cable car to pass through mountain pines. You can get to the monastery on foot via a long but doable walk. A cable car ticket costs 70,000 VND. Da Lat is also located in a strategic position for exploring the hills and central highlands of Vietnam. To get to know the region better, I recommend excursions around Kon Tum and Buon Ma Thuot. Moreover, if you’re also traveling with children, near Da Lat, close to the Datanla Waterfall, there’s an Adventure Park where you can have fun navigating through the rain forest. You can go canoeing, take a zip line and try rock climbing on the cliff. There are also wooden roller coasters and a sort of skateboard for an adventure through the trees. An entrance ticket doesn’t include the falls, which you’ll have to pay for separately. The price is 100,000 VND.